The distinctive sound of the Skylark, heard high above a field for many minutes, unfortunately is rarely heard in western Europe today. The Skylark is not doing very well. The species has diminished, probably due to increasingly intensive agriculture. 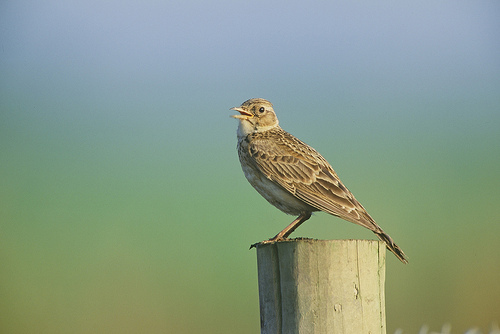 The Skylark usually flies above open countryside, the Woodlark is a bird of forests and bushes. The Skylark has more trills in its song. 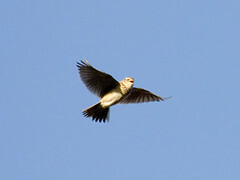 A Skylark looks more like the Sparrow, while the Meadow Pipit with its longer body and tail looks more like a thrush. Of course the songs are very different.